Northville District Library's Local History/Genealogy Collection has benefited from community members and organizations who have donated time and/or funding towards making our collection what it is. If you would like to volunteer, here are just a few ways you may do so. 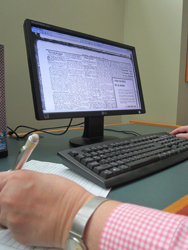 The Library has a number of local history projects in need of volunteer help. Contact the library and see if a current project sounds interesting! The Northville Genealogical Society has donated their book and magazine holdings to the library's genealogy collection and have donated funds for purchasing additional genealogical materials. During designate times, or by appointment, members also donate their time to assist researchers. The Northville Historical Society maintains an archive at historic Mill Race Village on Griswold Street, across from Ford Field and offers many opportunities for those interested in volunteering.